This section of the Garden is marked by two built structures – a Basotho hut and a Hartbeeshuisie (a traditional Afrikaner home). 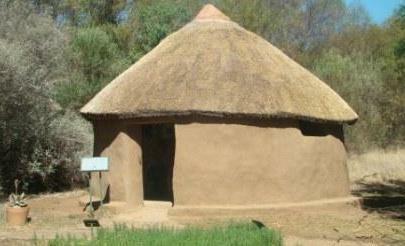 These houses serve to culturally contextualise South African traditional medicine. The diversity and horticultural splendour of our medicinal flora is displayed here. Displays of dried medicinal plants can be seen in the Basotho hut. Plants grown in the Medicinal Garden are selected on the basis of their common usage or rare status. These include various medicinal plants from South Africa and the Free State in particular, such as Bulbine frutescens (burn-jelly plant) and Tulbaghia violacea (wild garlic). More than 30 medicinal plant species are grown here, making the garden a must to visit. The best viewing time is from late spring to late summer. A word of caution, the information on the plant interpretive labels and storyboards comes from publications and available literature. SANBI does not guarantee the effectiveness or safety of the treatments, medicinal uses or remedies described. Some plants are highly poisonous if eaten or taken in large doses. Guided tours can be arranged by contacting the Garden office on +27 (0)51 436 3530.